Former Hospital de Santa Maria, catedral Nova, Capella del Peu del Romeu and Sant Joan; four monumental sites. It is a Gothic-Plateresque building from the 15th and 16th centuries and currently houses Institut d'Estudis Ilerdencs and Gabinet Numismatic, with coin collections from all the historical periods of Lleida. The main facade displays an image of the Virgin and shields bearing the city's coats of arms. 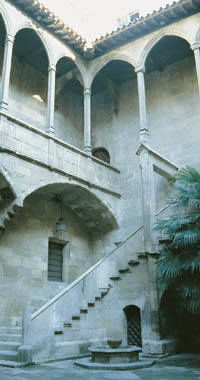 A stone staircase rises from the magnificent central courtyard and finishes in a gallery with pointed arches. The building has the Gothic Room, used for temporary exhibitions and which has a Baroque altarpiece in the 18th century by F. Escarpenter dedicated to Our Lady of Angels. The Archaeological Room displays prehisotoric, Iberian, Roman and Visigothic exhibits.